This week’s WIPs have included some finished objects, and some non-crafty things! The run up to Christmas seems to have a surprising number of ‘extra’ jobs, some more fun than others. I finished the slippers last night, and took this (rather disappointing) photo earlier today just before I applied the sock stop to the soles. Natural daylight is very weak at the moment so I’ve been taking photos in artificial light and the colours just don’t look the same. Anyway, they are done and I’m quite pleased, I just need to add buttons. They are for a little boy whose uncle also has a pair of these and I have buttons left over from his so they can match! Last week I mentioned wanting to knit a scarf for myself. By Friday, we were on a weather warning for snow and I was desperate for a scarf so I abandoned the idea of knitting and decided to crochet one instead, using v stitch. It took about 4 hours in total and is just over 4 feet long. I sewed the ends together to make a loop, and it goes around my neck twice. Having tested it in some very chilly temperatures I can confirm it is really cosy and it goes with my coat too! 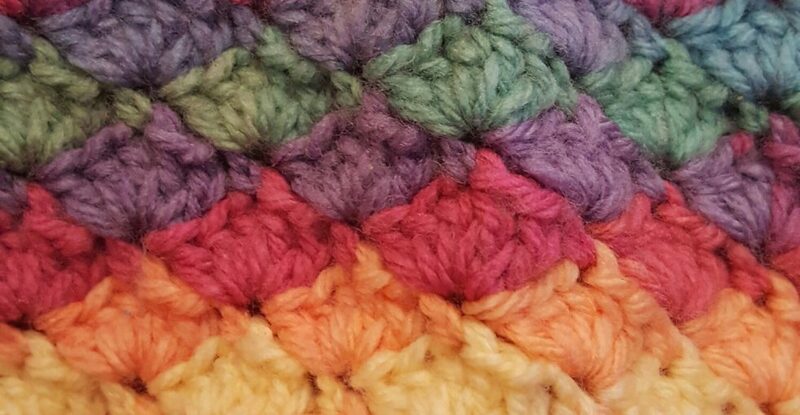 I used an 8mm hook and super chunky yarn so it was an amazingly fast make. I also have a lot of that yarn left so I could make another, or I could knit one when I have time. I’m also on the lookout for a nice hat pattern to go with it. If you have any suggestions please comment! Other WIPs have included present wrapping, a job which I really dislike. However, Mr C ‘treated’ me to a sellotape dispenser and it has revolutionised my wrapping. I’m practically a pro now; I’ve even watched YouTube videos about wrapping. My gifts no longer look like they have been simply screwed up in a ball of paper with a token strip of sellotape attached. I have also had the torturous task of supervising my son write his Christmas cards to the whole class. It was a painful process as he insisted on adding many (at least 30) kisses to each of his girlfriend’s cards. (Mr C informed him that having multiple girlfriends is a bad policy!) With my 3 year old, I wrote the names and she did the kisses and this was far quicker, but obviously independence is important so I encouraged my son to do all of his. What have you been up to this week? Is craft time being replace by other festive tasks in your house? Let me know! They both look great! 🙂 It is insanely busy at school in here and I will have 3 tests in a row on three days next week. So I have been trying to study ahead while finishing up Christmas gifts (although I didn’t do many this year) and also have been writing a draft for the future post that is still not yet finished. But I love this time of the year and it is a bit sad that all the school stress tries to ruin it. Happy Holidays! Thank you, happy holidays, hope you don’t have too much stress! Thank you, I agree that neat wrapping is satisfying, I just rarely achieve it! Can’t wait to see what’s in yours! I do hope you find time to relax closer to Christmas. You have been as busy as Santa’s elves and even they get a day off on Christmas day. I think. Lol! Thank you, I finish work next Tuesday so I’m sure things will ease up a bit then! Haha 🙂 It sounds like youre having plenty of fun at least! I keep forgetting to open my advent calender- this way Christmas doesn’t get any closer right??? Sadly not, but you’ll have a whole load of chocolates to console yourself with! I can certainly understand the Christmas card writing experience – mine are all old enough to go it alone now! Mine use to add a candy cane to every card – somehow there was always at least one that was “broken” and had to be eaten by the writer. Lol, I’m sure many were ‘accidentally’ broken! The scarf looks so cosy. I have spent two afternoons writing card and another tying myself in wrapping paper. Certainly has cut into crafting time. It really does, doesn’t it! The scarf is being well used, I’m really pleased I made it. I’m in love with the scarf. Very jealous. … so if you ever ‘lose’ it …. you’ll likely find it hanging around my neck. The childrens cards … ohhh you brought back sooo many memories. I can remember one Christmas being almost brought to tears trying to get daughter No.2 to write out her cards while I wrote the envelopes for them. She was such a whiner, moaner, groaner, and a total ham actress, telling me how much writing the cards made her hand ache. Her whole arm ache. Her body was now giving up. The only way things would get better, she told me, was by having some chocolate. Chocolate? She was at this point, in danger of being murdered. I really don’t envy you that job. Nor do I look forward to doing that job that you’ve begun … wrapping the presents. I haven’t wrapped even so much as one yet. I’m SO behind. Goodness knows why. But I guess I’d better get on with it! Lol, thanks. Luckily we are done with the cards and everyone survived! We had the aching thing too, and he made me count several times to see if he’d done enough yet! I love the colors in your scarf! It looks so soft. Thank you, it is really lovely and warm. Good job on the FOs- they look great! Thank you, I’ve finally recovered from the card writing! I really must crack on with wrapping now. I'm still crafting away, but I really must wrap some of my makes soon. On Saturday I made an amigurumi cat in about 3 hours, which I was super impressed with, but then I had to rush to get to the event where I was handing the kitty over so it ended up being wrapped in tin foil! Lol, that’s impressively fast making though! Thank you, it’s been very handy so far.